elcome to the Eosinophil Connect PIN (Patient Insights Network) for eosinophil associated diseases. The purpose of this registry is to develop a comprehensive database of individuals who are diagnosed with an eosinophil associated disease, to better understand the characteristics of these diseases, to determine areas that need further research, and to help pharmaceutical companies with the development of treatments to improve the lives of those affected. To learn more about eosinophil associated disease, visit www.apfed.org. 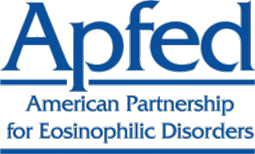 The American Partnership for Eosinophilic Disorders (APFED) is a non-profit organization dedicated to patients and their families coping with eosinophil associated diseases. APFED strives to expand education, create awareness, and support research, while promoting advocacy among its members.